So on Monday I posted some graphs that were intended to provide some context for some of the distance race results over the weekend. Sprinting wasn’t left out in the cold because I dislike it (although, to be fair, I’m sort of a traditionalist in this respect; I will always love distance racing more, sorry! 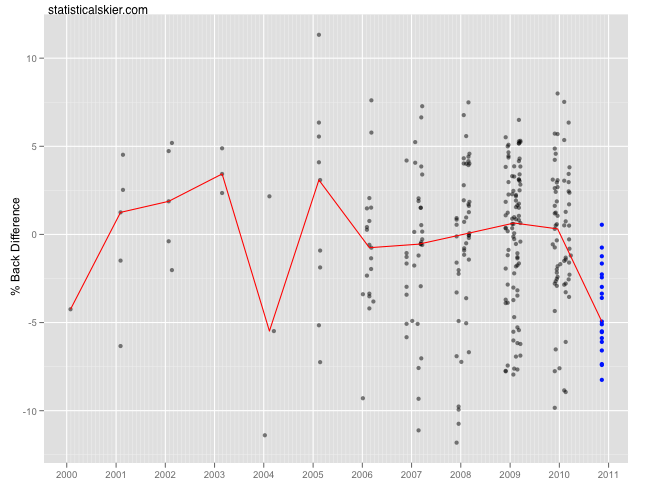 ), but because it’s much harder to do meaningful analyses on sprint races. But it’s just not fair for me to ignore sprinting, so even if it’s not ideal, I should at least try. What follows is essentially the same analysis I did for the distance events, but for the qualification round of the sprint races only. So all of this only applies to one’s ability to qualify, relative to the other competitors. An important aspect of sprinting, to be sure, but only part of the story. Since the qualification round is really just a mini-interval start race, we can treat it that way and make graphs just like I did on Monday. I’m going to focus on three people whose performances I found particularly interesting: Kikkan Randall, Ida Sargent and Torin Koos. Recall that I’m taking the top 40 or so from the qualifying round and then looking at every instance of Kikkan Randall competing against one of these people in a sprint qualification event. Each dot represents the difference in percent back (from the fastest qualifier). Negative values mean Randall was faster than that person on that day in qualification and vice versa. It’s important to note that this does not mean anything about whether Randall actually made the heats in any of these races! Again, we’re essentially treating the qualification round like a mini-interval start distance race. 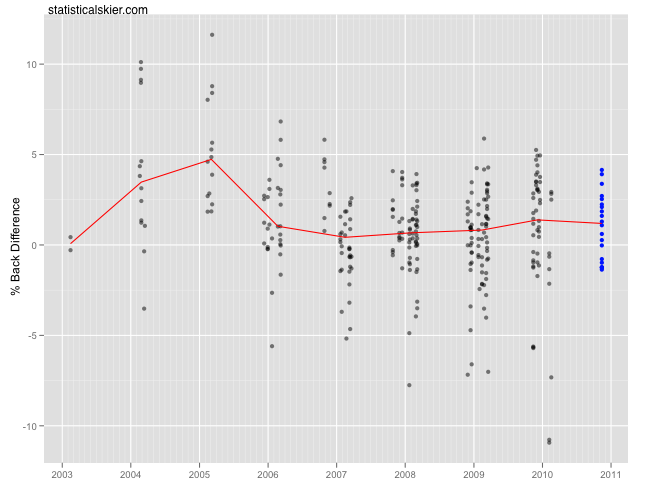 Also, I added a red line marking the median for each season, to help us track trends. Obviously, this was a fast qualification round for Kikkan, and represents a considerable improvement against the field in Muonio, compared to her past encounters with these racers. Prior to 2005, the data get a bit thin and things bounce around a lot, so we should probably not pay too much attention to that part of the graph. His qualification effort in Beitostoelen doesn’t appear (by this measure) to mark much of an improvement over the past, against this particular group of skiers (nearly all of whom were Norwegian). 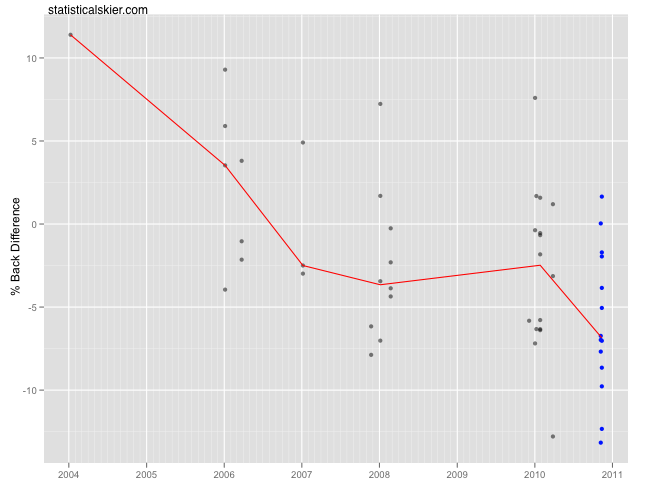 Not bad, but just no different from his qualification speed over the past 4-5 years. Again, the flatness of this trend is a little tough to interpret without knowing how often he was qualifying in these races. But at the very least these data suggest (as with Kikkan) a period where his performance against this particular group of skiers in the qualification round hasn’t changed much, relatively speaking. The last skier I wanted to look at was Ida Sargent. She’s a bit of a challenge, since she’s so young, I have very little data on her. I had to widen the data collection net considerably for her graph (going deeper down the qualification results list) and even then, the data are thin. So this one should be interpreted with extreme caution. Here there be dragons, and all that. The blue here actually represents both of her sprint races in Muonio; I included skiers from either race in her comparison to increase the sample size. And even then, as you can see, there’s not much data. Still, it certainly matches out general impression that those were darn good qualification efforts on her part. Luckily, I really only needed to use the qualification round results for this, because there is something seriously awry with the women’s sprint results from Muonio from Nov. 7th. Check it out for yourself: qualification results and final results. The top eight look ok, and from 35th down looks ok. But man, in between there’s a whole lot of nonsense going on. For instance, consider the case of Ms. Knap. So I’m assuming the qualification round results from FIS are correct. Who knows, though. Posted by Joran on Wednesday, November 17, 2010, at 1:49 pm. Filed under Uncategorized. Tagged ida sargent, kikkan randall, recap, Sprint, torin koos. Follow any responses to this post with its comments RSS feed. You can post a comment or trackback from your blog.